Location, History, Characteristics of Aboriginal Finger-Fluting. 70 metres under the Nullarbor Plain. Koonalda Cave is a limestone sink-hole filled with aboriginal rock art, which sits about 70 metres (235 feet) below the flat, treeless and burning hot surface of the Nullarbor Plain, South Australia. This crater-like doline contains several chambers including a main chamber similar in size to a sports stadium. Parts of the softer cave walls are densely covered with "finger-fluting" - one of the oldest forms of prehistoric art - executed in geometric-style herringbone patterns, lattices and grids covering several thousand square feet. This is not sophisticated parietal art in the manner of Lascaux or Altamira. 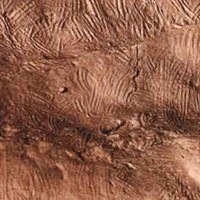 These primitive finger markings and stick scratches - forms of which probably underlie much of Europe's famous cave painting - make up no recognizable image or symbol. But their creative expressiveness is undeniable. So far, the oldest art at Koonalda has been dated to about 20,000 BCE, but human occupation of the site has been dated to 25,000 BCE which, when added to the relatively primitive nature of the cave art, raises the strong possibility that older dates may be forthcoming. Other famous examples of Paleolithic art in Australia include: the Nawarla Gabarnmang charcoal drawing (26,000 BCE); Burrup rock art (c.30,000 BCE) in the Pilbara; Ubirr rock painting at Kakadu National Park (c.30,000 BCE), not far from Kimberley rock art (30,000 BCE) in Western Australia, notably Kimberley's exquisite Bradshaw paintings (Gwion art), recently dated to at least 15,500 BCE. The likelihood of even older dates is a strong possibility, following the recent dating of Sulawesi Cave art (Indonesia) to 37,900 BCE - not least because Sulawesi forms part of the island "land-bridge" between the Asian continent and Australia. Note: To put Koonalda's finger-fluting into context, the oldest African cave art is the Blombos Cave engravings (70,000 BCE), while the oldest European cave art is the El Castillo Cave paintings (39,000 BCE) of Spain, and the French Abri Castanet Engravings (35,000 BCE). Koonalda Cave is situated inside the Nullarbor National Park, roughly 100 kilometres (60 miles) northeast of Eucla, on the southern edge of the Australian continent. One of the largest of the 170 known caves on the Nullarbor Plain, its opening on the surface consists of a huge 85-metre diameter sinkhole which drops vertically for about 30 metres (100 feet), followed by a less vertical drop of 40 metres (135 feet). At the bottom, on the northwest side, is an opening into the cave itself, which leads into the spacious main chamber (the Gallus site). From here, a steep climb, flanked by free-standing rounded boulders, leads to the upper chamber or art sanctuary. Towards the back of the cave - some 900 feet from the entrance - the floor drops steeply to the rear wall, through which a narrow passageway ("the squeeze") leads onto a ledge overlooking a lake. In fact the same lake can be reached via a tunnel near the cave entrance. According to archeological evidence, the cave was used by aborigines as a flint mine. Chalcedonic quartz was quarried from the cave and moved elsewhere to be made into stone tools. Pits up to 6 metres (20 feet) deep were found not far from the entrance, containing remnants of quarrying equipment. The cave was abandoned about 16,000 BCE, although whether its location was known to, or revisited by, later aboriginal people is not known. In 1935, it was explored and noted by an expedition lead by Captain J. M. Thompson, although no reference was made to the Stone Age art or any particular artifacts. Indeed, it wasn't until the 1950s that Adrian Hunt first noticed the rock engravings and finger markings, and Norman Tindale discovered stone tools around the sinkhole. All this then came to the attention of the archeologist Alexander Gallus, who in 1956 examined the cave and recognized that its art was similar to the petroglyphs and other rock art found in famous European caves. Accordingly, from 1956 to 1964 Gallus conducted a series of excavations of Koonalda, which examined and documented much of the cave art. He was followed in 1967 by a team of scientists from the Australian Institute of Aboriginal Studies, led by Richard Wright. During the first set of excavations, Gallus obtained a number of radiocarbon dates which showed that the cave was used by miners and other temporary occupants during a period lasting from about 28,000 to 12,000 BCE. This dating was confirmed, in the main, by Wright's 1967 excavation, which also dated some of the finger-fluting to about 20,000 BCE. Thermo-luminescence dating methods have narrowed the occupation range to approximately 25,000-14,000 BCE, although some evidence suggests that the cave was first used as early as 32,000 BCE. In any event, aboriginal artists were active at Koonalda during all four of the main periods of the Upper Paleolithic, namely: the era of Aurignacian art (40-25,000 BCE), Gravettian art (25-20,000 BCE), Solutrean art (20-15,000 BCE) and Magdalenian art (15-10,000 BCE). For more about dates and chronology, see: Prehistoric Art Timeline (from 2.5 million BCE). There are four basic types of cave art at Koonalda. (1) Digital-fluting and similar marks made with finger tips in the soft powdery limestone walls (moonmilk). These markings, which feature lattice shapes, herringbone patterns and various fan-like shapes, occupy a large area, and are believed to have a similar function to hand stencils and handprints found in the Kimberley and other parts of Australia. (2) Geometric petroglyphs or engravings made by implements like sticks or stones. These scratchings are made on harder surfaces - most noticeably around the "squeeze" - where the surface is clean and devoid of other marks, and in general they form specific geometric images. All these wall markings are assigned to the Pre-Panaramitee tradition. (3) Prehistoric sculpture, notably in the main chamber, where a large stelelike chunk of limestone has had a human shape carved roughly into it. (4) Megalithic art, in the form of very fine, intricate engravings of zoomorphic and geometric-like shapes, scratched onto rounded limestone boulders carefully arranged on either side of tracks traversing the upper chamber. Very often these engravings have been tailored to match or enhance the curves and hollows of the rock surface. Anthropologists believe that the Koonalda wall markings are pictographs that represent certain sacred aboriginal themes concerning, life, death, birth, marriage and the like. This view supports the growing realization among archeologists and other scientists that the interpretation of ancient art in Australia is only possible when scientific know-how is combined with a knowledge of Aboriginal languages and customs.  For the oldest known rock markings, see: Cupule Art.  For the world's oldest art, see: Bhimbetka Petroglyphs.  For more information about prehistoric art in Australia, see: Homepage.